Random House Books for Young Readers, 9780375861758, 240pp. Pamela Ferguson's debut children's novel is a treat to read, a light-hearted tale of magical realism that moves between joy and sorrow to find meaning in the roller-coaster experiences of life. PJ Picklelime lives in a village very close to you. Meadows are knee-deep in wildflowers in early springtime. Summers are hot and dreamy when golden peaches the size of melons hang from the trees. Snow drifts like powdered sugar down the mountainside in winter. Life in PJ Picklelime's village is always a little out of the ordinary . . . just like PJ herself. There's the day Lemon Pie, a yellow warbler, came to live in her bushy crop of black hair and the morning when PJ cut her hair to help mop up an oil spill. There's the afternoon she made sweet, memory-filled lemonade that drew people from blocks away, and the night she chatted with owls in a barn full of honey. But PJ's spring is not all roses and rainbows, and after Lemon Pie flies away, PJ's parents split up, and a friend dies unexpectedly, PJ turns to her neighbors, with their philosophies from all over the world, for help in understanding. Can PJ find a way to recover her sunshine? Only a person who has lived as richly as Pamela Ellen Ferguson has could create such a textured work of fiction. She was born in Mexico, grew up in Britain and South Africa, and has lived and worked in over a dozen world capitals. A former journalist in London's Fleet Street, she is now a leading instructor in Zen Shiatsu, and her books for adults, both fiction and nonfiction, have been translated into several languages. Pamela lives in Texas, surrounded by a garden with cacti as tall as trees. 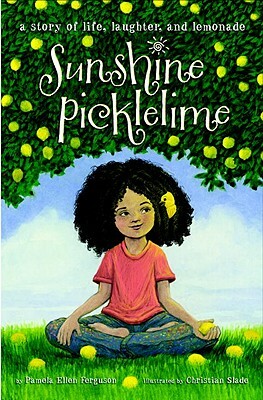 "Sunshine Picklelime" is her first book for children.